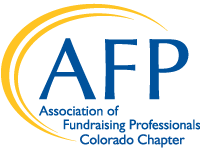 AFP Office will send out email blast to all AFP Colorado Members. Then later that week the position will be posted on the AFP Chapter Website for approximately 1 month. Deadline is Wednesday by end of day to be included in the next day's Thursday email. You may send the job description and any other information about the job that you want to share. to info@afpcc.org and we will post the link to the posting. It can be any length. Send Word documents, pdf's or links to online postings. Be sure to include a target date, so that the email goes out at the appropriate time. We try to have all job postings in one weekly other than the ones that go out immediately. AFP Members - $50 - For regular posting in Member's Thursday Thoughts email blast and to the general public on the website. Nonmembers - $100 - For regular posting in Member's Thursday Thoughts email blast and to the general public on the website.